If you follow our social media pages (Twitter and Facebook) you’ve see some images being posted. What are they you ask? 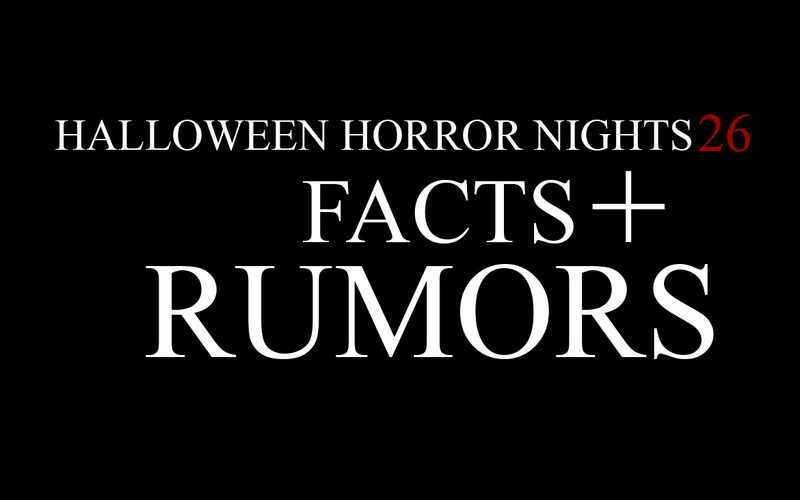 They are images relating to rumors and speculation floating around about Universal’s Halloween Horror Nights 26. Miss them? We’re here to go over everything right now! This was the first image we posted. This house has been rumored on and off for a couple years now and everyone assumes that if HHN has The Walking Dead this would never happen as two big IP’s just can’t co-exist together. Would this IP replace TWD this year? Well as we found out last week, that’s a NO! We also have some rumor that a “mega” or “uber” house would return this year, could American Horror Story be this house? The second image was the pumpkin/skull used in the original Halloween 2 movie. This is also a Universal release, however does the rumored name reflect the Halloween 2 movie, or Halloween 2 as the second Halloween house in Orlando? If the first, it could follow Michael Myers in and out of the Hospital. If the later, it could be a mashup of all the Halloween movies. Our third image posted, and as you saw was officially announced a couple days later. The Walking Dead returns for the 5th year in a row! What can possibly be different? Well nothing at all as we’ll get a repeat of the past 4 years in one house. Could this be the end of TWD at HHN? Some hope so, some don’t. IMO, end it as an HHN attraction and see how Hollywood’s permanent TWD attraction works and add it to Orlando. The fifth image posted was an image from Halloween Horror Nights 14 in 2004 of the Ghost Town facade. For those that missed it, Ghost Town was a pretty well done house and this could be a sequel to that. The fourth image was for The Purge: Election Year. Rumors point this to a street or possibly STREETS using all three Purge movies. I enjoyed The Purge better as a street rather than a house, although the house was converted from the already built “Scream” house at Halloween Horror Nights 25 which was canceled at the last minute. We also have the following which were announced earlier this year. That puts us at 6 houses and 1 street (possible whole park). Rumors also point to at least 2 more original houses. But wait, what’s that I hear? What about shows? Early rumors have a “Magic” show from 2 guys that had a house. We’ll let you guess that one! Keep in mind it’s still early, anything can change at the last minute as some of you saw last year. So let’s sit back and see how all this plays out! If you want to get up to the minute information and updates follow our social media pages and our Halloween Horror Nights 26 forums.